This week I was lucky enough to visit a distillery of one of my favourite gins, in one of my favourite cities! 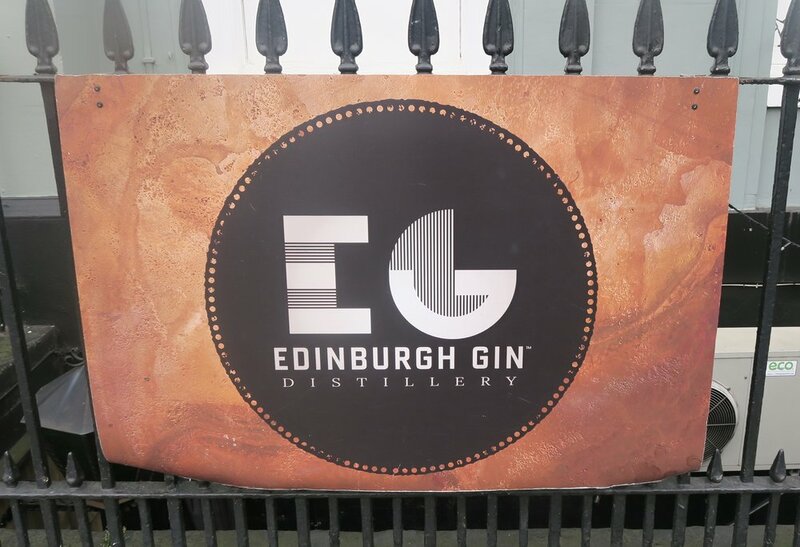 On what happened to be "International Gin and Tonic Day" yesterday, I headed to Edinburgh Gin Distillery to meet Head Distiller and all round great guy, Dave Wilkinson. The distillery really is a hidden gem, when you arrive you walk down some stone steps to an underground cellar where you are greeted by the incredibly friendly staff. Though the tunnel to enter the distillery, you go past the smallest gift shop i've ever seen, where you can buy the different gins and liqueurs on offer as well as other souvenirs. I bought an Edinburgh Gin Glass but was tempted with the vintage style prints, oh well, I'll just have to go back. Continuing through the tunnel, there are a couple of booths for you to enjoy a gin or two before the room opens out where the tours and gin classes take place. This cool and quirky place, doubles up as the Heads and Tales Gin Bar at night, which has great atmosphere and a huge list of gins to choose from, which they mix and specifically garnish for your chosen tipple. I'll definitely be returning as soon as I can! Dave led us round the back to the still room, which is behind panes of glass so everything is fully visible from the bar. The distillery has two beautiful copper stills, Caledonia and Flora and another called Gin Jeanie at a second distillery at The Biscuit Factory Distillery in Leith (which I hope to visit soon as well), this was custom made in order to increase the production of their gins. Edinburgh Gin currently create three gins. Edinburgh Gin - their original London Dry gin. Seaside Gin - inspired by the East Coast's beaches, originally created using foraged coastline botanicals including scurvy grass and ground ivy. This gin was a collaboration with the Heriot-Watt University’s Brewing and Distilling MSc course with very few bottles created, this is now in constant production and is one of their bestsellers. Thirdly, we have Cannonball, a Navy Strength gin at 57.2% ABV, this gin uses double the amount of juniper as Edinburgh Gin. It certainly packs a punch but it still incredibly drinkable even on it's own. Using Szechuan peppercorns to give a warming spice alongside lemons and oranges for a touch of citrus. There is also a Christmas Gin that arrives seasonally using frankincense and myrrh, although this year's gin has been given a little make over to make the gin spicier following the feedback of it's drinkers. You'll also be able to find a number of really tasty liqueurs - Raspberry, Elderflower, Rhubarb & Ginger, Plum & Vanilla as well as the newly released, Pomegranate & Rose. While I was at the distillery a brand new gin was being created, but as much as I tried they would break what it was but watch this space as it'll be launched next Spring. I had the best time visiting Edinburgh Gin and can't thank Dave enough for taking time out of his day to meet me! I will definitely be coming back to the distillery and urge everyone to pop in for a tour or "Make Your Own Gin" class if you find yourself in Edinburgh and definitely check out the Heads and Tales bar in the evening. For more details on the tours and classes check out the distilleries website. Follow Feel Ginspired on Facebook, Instagram and Twitter for a blog post on each gin coming in the future!